A woman holds up a sign that says, "resist," as supporters of the Deferred Action for Childhood Arrivals (DACA) block an intersection near the U.S. Capitol in support of DACA recipients, March 5, 2018, on Capitol Hill in Washington. A breakaway group of Republicans in the U.S. House of Representatives plans on Wednesday to defy their leaders and join with Democrats in an attempt to force action on legislation that would protect young, illegal immigrants from deportation. The rare move could trigger a House debate next month on four bills to replace the Deferred Action for Childhood Arrivals (DACA) program, which President Donald Trump opposes, and potentially break a congressional stalemate on immigration. Congress has struggled for years to overhaul immigration law, deadlocked over an issue that Trump exploited to great effect in the 2016 presidential campaign and that is already key in races heading into November's congressional elections. Under the bipartisan effort, whichever of the four bills gets the most votes, and at least a majority of the House, would be sent to the Senate for consideration. House backers think that if they can pull off the legislative feat, enough members of the Senate would vote for a bipartisan bill to ensure passage. Trump has proven to be erratic and many lawmakers have given up predicting whether he would sign or veto legislation. Florida Republican Rep. Carlos Curbelo is followed by reporters as he arrives for the Republican Caucus meeting on Capitol Hill in Washington, May 2, 2017. So far, about two dozen of the House's 236 Republicans have signaled support for the initiative, including Representatives Jeff Denham of California, Carlos Curbelo of Florida and Will Hurd of Texas, whose districts have Hispanic populations. They hope to move procedurally to force votes on four competing bills. Coupled with strong Democratic backing, the initiative has a potentially powerful coalition behind it. A group of Republican House members has scheduled a press conference for later Wednesday to discuss their plans. Since taking office in January 2017, Trump has moved on several fronts to clamp down on legal and illegal immigration. Last September he announced he was terminating former Democratic President Barack Obama's 2012 DACA program, which has protected from deportation about 800,000 undocumented people who were brought to the United States illegally as children, mainly from Mexico and Central America. Moves in Congress to replace DACA with legislation allowing them to live and work legally in the United States collapsed in the Senate in February. Courts are reviewing Trump’s termination of the program. 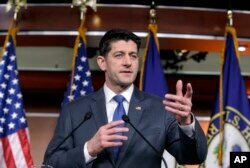 Speaker of the House Paul Ryan, R-Wis., speaks during a news conference about the massive government spending bill moving through Congress, on Capitol Hill in Washington, March 22, 2018. Several of the Republicans pushing to revive legislation with a quick House floor vote are moderates, with some of them facing potentially tough re-election bids in November. House Speaker Paul Ryan has expressed support for doing some sort of “DACA fix” but so far has refused to set the stage for floor debate of any bill. Among measures that could be debated is a bipartisan bill to protect “Dreamer” immigrants while also adding border security measures, but not the border wall Trump demands. Another bill would protect “Dreamers” from deportation and put them on a path to citizenship. A third would provide some protections, but would reduce legal immigration to the United States. A fourth bill would be one of Ryan’s choosing.